Or should that be "Manchester Guardian Review"! Robyn Hitchcock starts the set with the wrong song. Moments later, he introduces a guest musician as "the voice of Maurice Windsor - accompanied by his body". If The Fast Show had ever wanted to do a pastiche of a whacked-out, quaint, quintessentially English psychedelic explorer, they could have simply wheeled Hitchcock in front of the camera.After 30 years in the business, the former Soft Boy identifies his music as "folk rock" - a term, he acknowledges, that tends to strike terror into the hearts of anyone not in possession of a woolly cardie and the complete works of Fairport Convention. "I don't think there's anything more threatening," he concedes, even "being strapped naked to a block of ice listening to 50 Cent". But "folk rock" doesn't describe the complexities of Hitchcock's oeuvre: he is part comedian, part social historian. One surreal monologue explains how the Germans' mistake, when invading Poland, was "not having any jokes".After congratulating the audience for having "their eyes in the right place", this vocal critic of the Iraq war serenades "our rock'n'roll prime minister" with I Wanna Destroy You. Perhaps Blair the would-be rocker could have learned from Hitchcock as others have. 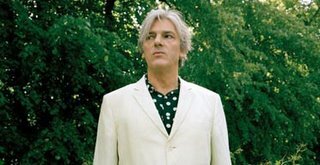 The Smiths' Johnny Marr is in the audience and REM's Peter Buck is on stage, relishing the smaller venue and the opportunity to weave sparkling Rickenbacker magic around Hitchcock's transcendent guitar patterns. The widely held notion that all Hitchcock's songs are about fish is misleading: here, creatures with scales feature in only one of every two. "Bring me fish eggs and a violin," he croons, beautifully. But lest this get too barmy, Hitchcock delivers a sentiment his audience seem to understand: Television - about TV addling the mind - and its chorus of "Binga bonga, bing-bong! "Hitchcock leads the Minus 3 band long into the night, acknowledging their own influences with a spellbinding take on the Byrds' Eight Miles High. Now 50, fetchingly grey-haired but still looking like an errant sixth former who clambered on stage with some crazy dudes, the genius-guitarist-songwriters' genius-guitarist-songwriter is clearly in no mood to come down.